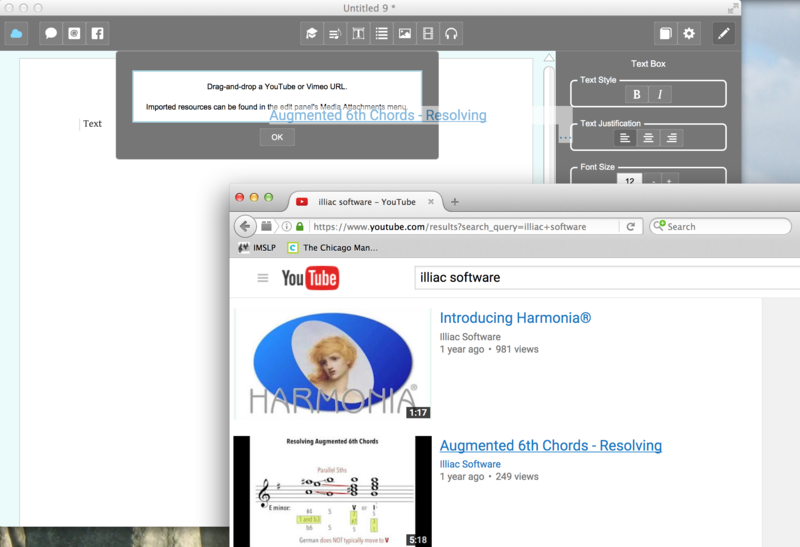 Harmonia supports a variety of multimedia options for teaching and learning. This means you can use videos to illustrate step-by-step guidelines for analyzing or composing musical examples, or personalize Harmonia documents with external audio recordings of musical scores performed by students or colleagues. You can even create melodic dictation exercises by disabling MIDI playback in the Assessment Menu and attaching external audio or video! This documentation outlines the steps required for attaching external audio files and video resources to a Harmonia document. Harmonia features high-quality in-app MIDI playback and additionally supports embedding external audio content. To embed an audio file, click on the headphone icon at the top-center of the Harmonia window and the drag-and-drop a FLAC audio file onto the pop-up window. Once added to the Harmonia document the audio will be stored and made accessible in the Media Attachments pull-down menu found in the Text Box Editor. Consider converting large audio files to video format, then uploading to Vimeo or YouTube and adding it as a video attachment (link) in Harmonia. 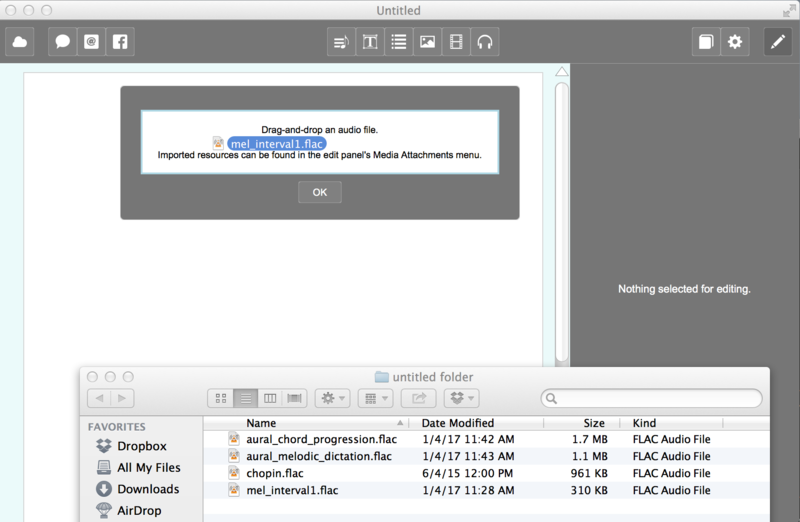 This completely eliminates the need to embed the audio clip inside the document. If your audio source is stereo, convert it to mono (single channel format) before importing. This will reduce the size of the embedded audio by a factor of 2. Consider reducing the sampling rate of your audio source from 44100 to 22050. In many cases this will not degrade the audio quality by much (if at all), and will reduce the size of the embedded audio by another factor of two. Audacity is a free audio application will allow you to export any audio file to FLAC. It can also merge stereo to mono, and even reduce the sampling rate. There are also numerous free FLAC players and converters available on the web. Drag-and-drop a FLAC file into the audio pop-up window. To add the audio example to the page in a particular location, create or open a text box and select the audio file from the Media Attachments A/V Resources pull-down menu in the Text Box Editor. 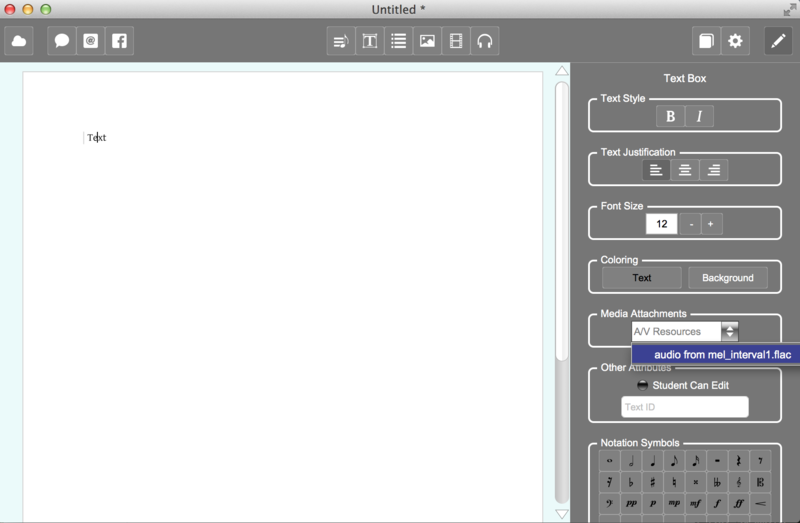 Select the desired file and a blue headphone icon will appear in the left margin. Click on the icon to listen to the example. Once added to the new document, find the file in the Media Attachments pulldown menu in the Text Box Editor. Create (or find) and upload a video to YouTube or Vimeo. Open Harmonia and select the video-strip icon at the top-center of the Harmonia window. In the pop-up window, drag-and-drop the selected link. Find the attached link in the A/V Resources pull-down menu under Media Attachments in the Text Box Editor. To attach the video, open a Harmonia text box and select the video link in the A/V Resources pull-down menu. A blue video strip icon will appear in the left margin beside the text box. Click on the icon to view the video. Note: Internet connection is required to view video content. Open a text box, click on the video-strip icon, and drag-and-drop a video link in the pop-up editor.